I am very interested in this ball. I need a ball that can go long due to my very slow speed. The Fever Pitch was one of the most surprising balls I have thrown to date. I usually have preconceived ideas of if I am going to like or dislike a ball prior to having the opportunity to throw it. The Fever Pitch being urethane instantly raised a red flag and subjected me to the notion I wasn't going to like it. I, also, wasn't going to even bother drilling it. My history with urethane was I could get to the pocket but couldn't carry. The Pitch Black would get there and I would go flat 10 and the Pitch Blue wasn't early enough. With that said, my preconceived notion was dead wrong. I absolutely loved the Fever Pitch and what I saw from this ball. The ball read early like urethane but this time it turned the corners better than both original Pitch balls and I could kick out the corner pins. I had some great hitting/carrying power with this ball with messengers scattering all over the place. It's almost like a ball that is in between urethane and reactive. That's the best way I could explain it. It's early yet continuous. I know most urethane lovers are going to love this ball and I believe the reactive bowlers who are reluctant with urethane may be decently surprised by the abilities and potential of the Fever Pitch. As someone who throws urethane from time-to-time and bowls a lot of tournaments… THANK YOU, STORM!!! This is a shape that was sorely missing for the Storm line. The traditional urethane covers that were on the Pitch Black and Blue are great at blending a pattern and giving a super smooth and predicable shape down lane, but if they are not so great on longer patterns or on carry down. The Fever Pitch solves for all of this! It is not as early as the Pitch Black but corners way harder than the Pitch Blue. The Fever features the brand-new PWR+CTRL Urethane cover that is very versatile for a urethane. I have thrown mine at box as well as a few different surfaces and my favorite default surface so far seems to be 1,000 grit. Even there it is not as early as the Black and still has more shape the Blue. I am so happy with this ball and see myself having many of these in the future. I see this being THE urethane ball on the market for many years to come. 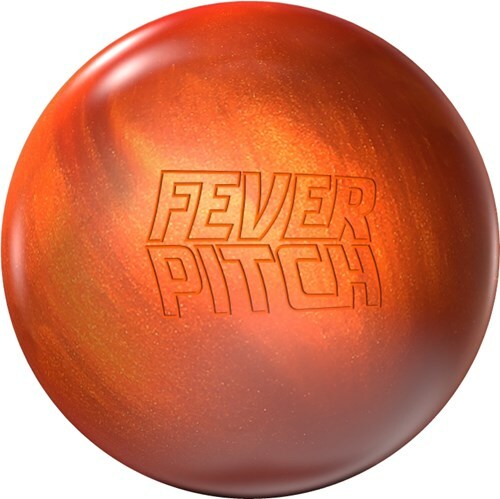 If you want to incorporate a urethane ball in your arsenal or need something for when the Pitch Black/Blue don’t give you enough shape on the back, you NEED THE FEVER. Overall the fever was a bit sharper down lane compared to the Pitch Black, given that sharper is not a regular adjective used to describe these types of balls. I used it in a tournament on a shorter sport shot and had a better feel with it. I assume the design intent is for less volume and or shorter pattern designs. When I finally threw it well I did strike a couple times but, my swing was wonky trying to stay tight and those wrap corner pins were letting me know that I was close but, not there yet. I have and will continue to recommend the Pitch series to players that need control on friction and to those folks that really twist it up at the bottom. I’ll also say that the Fever, by far is my favorite of the Pitch line. Stop by your local Storm VIP Shop and give it a look. The Fever Pitch is probably the most anticipated ball in some time. I was SHOCKED when I first threw this ball. It was a motion from “urethane” that we’ve been missing in our line. My Pitch Blue was by far the weakest urethane ball I had. The Fever Pitch is much stronger than the Pitch Blue and can be used on more than just the “driest of dry” oil patterns. It provides a good compliment to the Pitch Black as well. I think when the oil begins to carry down on the shorter patterns, the Fever Pitch be the go to ball because it has more pop than the Pitch Black. In all, the Fever Pitch is similar in strength to the Pitch Black, the difference lies in where they read the lane. The Pitch Black reads the front part of the lane HARD. The Fever Pitch sees the fronts less and offers some more motion down lane. Players can start out on the lower volume patters/shorter patterns with a Pitch Black. When the oil starts to carry down, you’ll be able to switch to the Fever Pitch with no problems. In my opinion this Fever Pitch will be better suited for the heavy handed guys and the slower ball speed players. Disliked the Hot Cell, Pitch Black and Pitch Blue. I could hit the hole ALLLLLL DAY and never throw more than a double. I don’t match up to urethane. Fever Pitch is different. First time I threw it I had a 9 bagger. I still control the pocket without any problem, but the Fever Pitch is strong enough and sharp enough on the back to give me the angle and carry I’m always seeing other people get. The Storm Fever Pitch utilizes the new Tour Core and the new PWR+CTRL pearl urethane coverstock. Usually a thick shell means a great ball. I think that is true with this ball also. The orange pearl cover has some real shelf appeal. It is growing on me. The Fever Pitch is longer than the Pitch Black and corners better than the Pitch Blue. I definitely get more back end motion from it verses my Pitch Black. I use the Fever Pitch as my spare ball and have to be careful not to cut it short when shooting the 10-pin because it will hook past. I’m not really a urethane guy… I’ve got a Pitch Black for short patterns and it works well when I’m actually able to use it. However, it’s not often that I can use urethane in league or anything other than a regional. Yet, with all of the hype around the Fever Pitch, I had to drill one up (hype or not, I would have drilled one…). I’ve had a chance to roll it on 2 versions of the PBA Viper pattern and was quite pleased at the reaction I got from it. While the Pitch Black rolls super early, especially with the 500 or 1000 surface, the Fever Pitch clears the fronts really well, but shapes much better down lane than previous urethane releases. I was able to play relatively straight, up the lane and move a bit left and bounce it off of the friction outside. I was surprised that it rolled that well for me. Cut to the first actual league game I’ve rolled with the Fever… The lanes were a bit squirrely and there seemed to be less friction to the right than we normally see in league. I decided to pull the Fever out towards the end of the 2nd game and proceeded to roll the last 16 to finish the night. A 300, on a house shot with the Fever Pitch. I was surprised with every shot, not that the reaction wasn’t amazing, but just that I had that much room to miss. Not to mention, the core design of this ball is really good. It definitely goes through the pins better than many urethanes. At this point, I have not altered the surface, but once I have a chance to roll on some more short patterns, I may have to scratch it down to 500 or 1000. Then again, if it continues to shape the way it does currently, I’m not sure I will. Being in the PBA South region, I should get plenty of attempts to use the Fever, and I plan to try it every chance I get. If you are a fan of the new generation of urethane, the Fever Pitch is a great option. The new urethane from Storm is called the Fever Pitch Pearl. First off with my roll urethane just doesn't match up with me. The pitch blue , Pitch Black and Hot Cell were just okay. The Fever Pitch has a new PWR+CTRL Pearl Urethane coverstock. I drilled mine with a stronger pin, 4 x 4 x 2 and added some surface. The Fever was a little cleaner than the pitch black and a little more shape downlane. I think the Fever will be get some more play on the shorter patterns and later blocks where I can't get resin down the lane. It definitely has a different motion and should fill a gap in Storm's urethane line. It seems like urethane can be used on almost any pattern these days. Several years ago, I don’t remember anyone using it, but today, it’s everywhere. Storm products has come out with several urethane balls, but the Fever Pitch is by far the strongest one I’ve thrown. With a revised Hyroad core and a pearl coverstock, the Fever Pitch is turns the corner extremely well for a urethane ball. I’ve drilled one so far and really like what I see. I put a very standard layout on the Fever Pitch: 5 x 4 with no hole. The pin is above my bridge with a slight shift of the CG. I’ve noticed I still need to put a good amount of surface on it (500/360) to get it to shape the right way, but it rolls great. I believe the pearl coverstock helps push the ball through the front part of the lane and creates a bit more angle down lane than a Pitch Black. If you need a urethane ball or drilled a Pitch Black, the Fever Pitch is much different and is needed in your bag today! This will be my first urethane ball since the SUPER NATURAL. I have a very end over end type of roll and what I see with the PITCH BLACK is early read/soft backend which is usually a no-no for my style which is med revs/med speed. I put the FEVER PITCH 4" to PAP with a 35* back angle. So far I have tinkered with it at box finish which is 2000 abralon. I have thrown this in practice on our house shot which is about 38-40' and the surface is pro anvilane but with a large amount of lineage as it is a 24 hour center that is always busy. The FEVER PITCH is surprisingly stronger in the backends than any of the recent urethane balls Storm has put out. I did throw the NATURAL some at a demo days and just left soft ten after soft ten. My SUPER NATURAL was more of the same except my adjustment to tighten up my angles would result in 4 pin or 4-9 combos and then back to the half tens. Face it, with the volumes of oil on the lanes compared to when original urethane was the ball of choice some styles are just not meant to throw urethane anymore. I do feel this will have a place in my bag. One to train my release with, two to take to USBC Nationals to shoot spares with, and three to use in place of an entry level ball on wood and very short patterns like 34' and less. The FEVER PITCH might just be the one urethane out that lower rev and older players can throw and not have it fluff tens all set. Just be prepared to square up your angles and throw it well and you will enjoy this look in your arsenal.